Apricot Cockapoo - Have You Seen This Stunning Color? You are here: Home / Breeds / Mixed / Apricot Cockapoo – Have You Seen This Stunning Color? The Cockapoo is a very popular crossbreed with a lot of different coat possibilities, including the stunning apricot Cockapoo! In this article, we will focus specifically on this lovely variation of the Cockapoo breed. We’ll detail how this coat is acquired in Cockapoos and what it means for the dog in health, temperament, and physical characteristics. First, it will be a good idea to get an understanding of how the apricot coat is bred into Cockapoos. Don’t worry, we will be keeping things as basic as possible! The coat color appears on any given puppy is controlled by genes. The puppy receives one gene each from its parents, for a total of a total of two coat color genes. How these genes interact decides which color is ultimately expressed within the dog. Certain genes are dominant, whilst others are recessive. A dominant gene will always be expressed over a recessive gene. For example, if a puppy received a dominant black coat color gene from one parent and a recessive red coat color gene from the other, they’ll be black. In the case of the apricot color, the gene is recessive. This means that both parents must pass on the apricot gene. This coat color can be somewhat rare in the Cockapoo, as it needs both parents to be at least a carrier of the apricot gene. However, apricot Cockapoos certainly have fans, and breeders can see that! Some specialize in breeding Cockapoos of this color, so you shouldn’t need to worry too much about finding one. If you have any questions about what coat color genes are present in a breeder’s parent dogs, ask! A good breeder should answer these questions confidently. Now that we’ve got all that out of the way, let’s get into what the apricot color may mean for a Cockapoo. Apricot coloring can be quite a spectrum; it can refer to many different shades from dark apricot which is close to red, to light apricot which is close to cream/white. In fact, there sometimes can be quite a bit of confusion between red and dark apricot and cream and light apricot! Whichever shade of apricot your Cockapoo may be, it’s important to note that this color does not bring with it any changes to the make-up of the coat itself. It can still be either corded or silky and smooth. While there are usually no recognizable coat patterns within this cross, it is possible for tan points to appear if they were present in the Cocker Spaniel parent. However, these usually will only affect under ten percent total of the coat. A small amount of white may also appear, usually on the chest and/or throat. It’s also possible for the apricot Cockapoo to have a liver-colored nose, eye-rims, and lips, as opposed to the usual black. Another important thing to note is that apricot coats may change shade over time as the Cockapoo ages. A dark apricot Cockapoo may eventually appear more like apricot Cockapoos of a lighter shade, or even white. It’s just another effect of aging! This coat color does not guarantee a certain temperament to the Cockapoo. Regardless of the coat color, a Cockapoo is still just a Cockapoo. They will not act a certain way just because of their coat color. However, there are many who would claim this is the case, despite the fact that there is no evidence. This is usually due to people holding superstitions or experiencing coincidences. If a breeder states that an apricot Cockapoo is of a certain temperament, be wary. While they may be just superstitious, it is equally possible they are employing a marketing trick. Such breeders that would go to such lengths to sell their puppies may be untrustworthy. Instead, expect the usual Cockapoo temperament to be present within this breed: intelligent, loving, and a natural entertainer! Any potential temperament issues common to Cockapoos may also appear in the apricot-coated variation. This is a breed that can tend to suffer from separation anxiety. They do best with a family who always has at least one member in the house to keep them company. Remember that a good temperament goes hand-in-hand with good training and socialization, a loving upbringing, and a calm, comfortable home. All of these will be necessary for your dog to feel their best! While health issues related to coat color can certainly happen, fortunately, the apricot Cockapoo does not need to worry about most. The one that may be most relevant to the apricot Cockapoo is congenital deafness. This is where one or both ears of a dog are deaf due to a lack of pigment inside the ear. This occurs in dogs who have a white coat, specifically around the ear. Therefore, it will not affect apricot Cockapoos. However, light shades of apricot can look like white. So if you are going for an apricot Cockapoo it is worth making sure that you’re getting the right color! Health issues relevant to all Cockapoos can still occur within this breed. It is still important to have an understanding of the conditions that this cross may be predisposed to. As with purchasing any puppy, choose a trustworthy breeder for the best chance at a healthy apricot Cockapoo puppy. Try to find a breeder who has recognition from established breeding societies and positive feedback from previous customers. They should prove that both parent dogs are free of any health concerns that could potentially be passed down to a puppy. Clean health evaluations for both parent dogs are good proof. It’s also a good idea to avoid any breeder who claims that the apricot Cockapoo is significantly healthier than other Cockapoos. Those claims are not true and could be a sign that they cannot be trusted. See here for more information on purchasing a healthy puppy. The full grown apricot Cockapoo will require quite a lot of grooming work, especially if they have the Poodle’s corded coat. Brush daily and thoroughly down to the skin. This will prevent matting. However, it is an option to cut the coat to a more manageable trim. Professional groomers will be able to perform this easily if you are not confident yourself. The Apricot Cockapoo: A Lovely Breed! So there we have it! 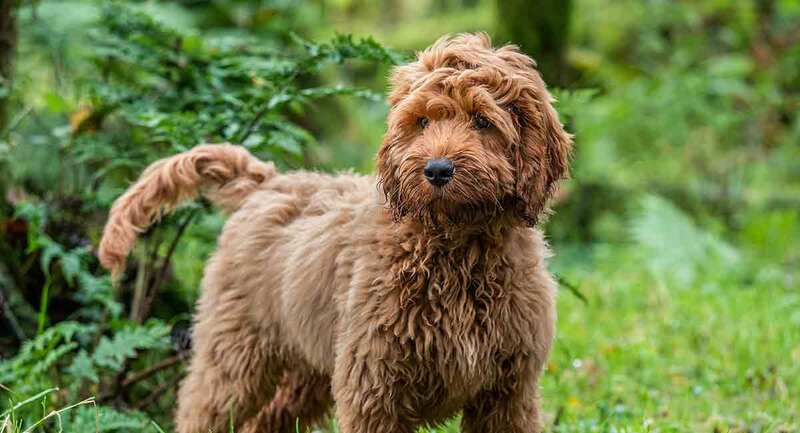 Hopefully, you have learned everything you need to know about this stunning variation of the Cockapoo breed. In summary, the apricot coat color within this breed does not bring with it any special traits or concerns. Do not trust any breeder that states that it does! They are, however, just as lovely as any other Cockapoo, provided they are given the right training and socialization. Have you ever owned an apricot Cockapoo? Do you have any stories to tell?